Pictek Wired Gaming Mouse: 2400 DPI, 4 Adjustable Levels, Designed for gamers to enjoy better performances and superb comfort. Nothing can stop you, Get It Now. 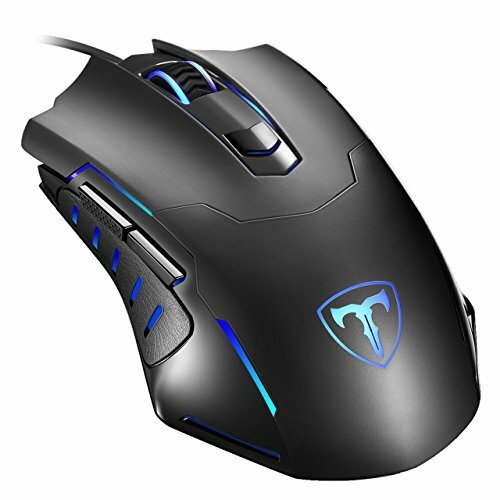 USB optical gaming mouse with adjustable DPI 800/1000/1600/2400, set your mouse with 2400 DPI to gain high speed and sensitivity accurately, It gives you unsurpassable accuracy and speed to dominate the playing field. 250Hz polling rate ensures smooth and high-speed movement in games competitions, the mouse never jumps during fierce gaming. You can personalize the color for the DPI as you like. DPI 800/1000/1600/2400 corresponds to 4 LED colors red / blue / green / pink. 6 Mighty Buttons For Gaming! Natural silicone roller and high quality rubber cable offers greater durability. Adopt USB interface provides stable connection and ensures faster data transmission speed. 【4 DPI ADJUSTABLE SETTINGS】800 / 1000 / 1600 / 2400 DPI. Easily adjust DPI button to instantly match mouse speed to different gaming scenarios with a one-press button on top of the wired gaming mice. It gives you the perfect range of sensitivity and smooth cursor control every time. Best laptop & pc gaming mouse with good value. 【6 BREATHING LED LIGHT MODES】Roller and logo backlight automatically change (The led light cannot be turned off), 6 different lighting modes are available via the driver offering red, blue, green, pink, yellow and cyan light, PICTEK gaming mice brings you the visual enjoyment during gaming or working. 【RELIABLE QUALITY & HASSLE-FREE WARRANTY】 PICTEK pc gaming mouse, 5,000,000 clicks lifespan, buttons with neat rebound and good feedback. High quality USB interface and 1.6M / 2.9ft durable rubber cable can undertake external pull. At Pictek, not only we offer high quality products, we back them up with 18-month warranty and a 30-day money back guaranty! If you have any questions about this product by PICTEK, contact us by completing and submitting the form below. If you are looking for a specif part number, please include it with your message.